But if the town is special in the spring, it’s romantic in the winter, when Christmas decorations are spread across Broadway Street. After midnight on weekdays, the town is silent, but those lights say all you need to hear. In the silence, there is peace. Then something like this happens that makes it even more magical. The pipes leading to an antique water fountain downtown burst. Someone takes a grainy photograph and posts it on Facebook, and off I go. I went to the 200 block of Broadway after work. No one was around. I pulled the car over on the street and pulled out my camera. No one saw me take the pictures. 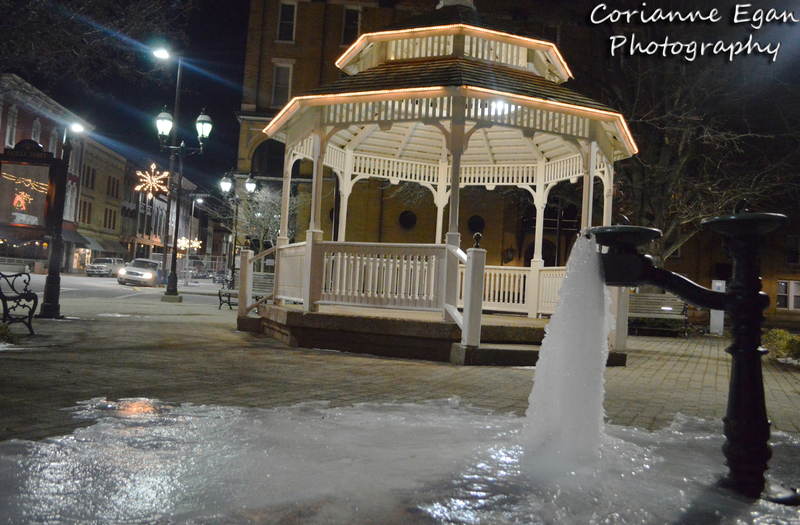 The fountain stayed frozen for weeks. The lights, however, went off the day after I took the pictures. When it comes to photography, I always love to take a photo that says something, that invokes a feeling. This photo makes me feel bitter cold, but when I remember that night, I feel peace.